There are few things more delicious than a plate of oysters, a wedge of lemon, some extra crispy frites and a glass of good white burgundy. Low in calories, high in nutrients, I love oysters and I am starting to learn the subtle differences between the myriad of varieties. 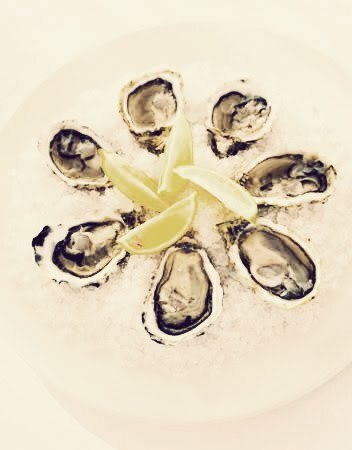 As Rowan Jacobsen, author of "The Oyster Guide" says, "Like wine and cheese, oysters owe much of their flavor to terroir, the specific environment in which they grow." His guide, "A Dozen Oysters You Should Know" is a great index of North American varietals for would-be oyster aficionados. Another overview can be found here. It would be great if more restaurants offered oyster flights, (like they do with wine) a guided introduction to the different tastes and textures. While I have a general understanding of North American oysters, I am just now familiarizing myself with European varieties. There is a tremendous amount of European oyster information here. My personal favorite of late is the Fines Claire. Generally available in Europe, I've had the best Fines Claires in Amsterdam. And, I'd love to sample a few fresh-out-of-the-water bivalves here.